After a two year wait, the much anticipated Fauna restaurant finally opened its doors at the beginning of September. As a result of constant disputes with the landlord, Chef Jon Svazas had to continually postpone the grand opening of his restaurant. 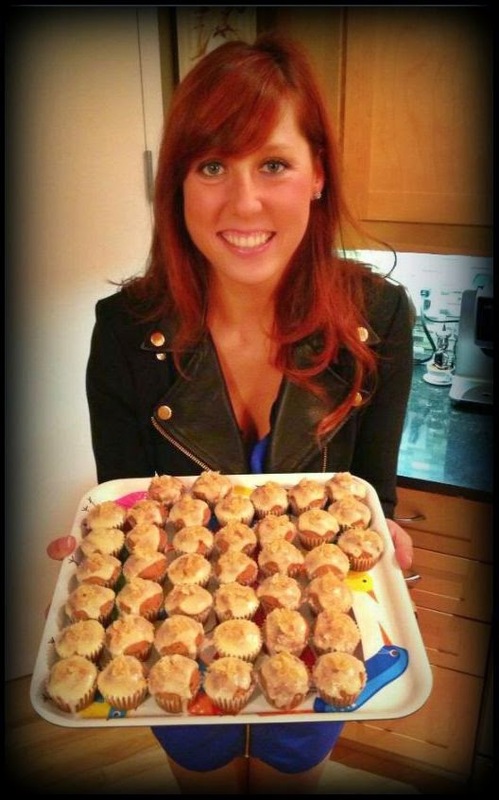 In the end, issues were resolved and Svazas was able to turn his culinary dreams into reality. Lola and I had long awaited the opening of this restaurant and as a result, we went into our dining experience with very high expectations. All of the hype and publicity really set the bar high. When we first entered the space, we were warmly greeted and seated at a table in the far corner, which was one of the few tables that offered some level of privacy between dining parties. All of the other tables were closely packed together. We did enjoy the atmosphere of the restaurant though, which boasted a trendy and contemporary vibe, with bursts of orange throughout. Having said that, the menu did not please us in the same way. We were disappointed to see the typical menu options that are popping up in so many of Ottawa's newest restaurants. There was of course the typical 'Steak and Frites', the always-present duck breast and the once-original-but-now-overdone pork belly. There was nothing exceedingly original or different that caught our eye, with the exception of the Kimchi Caesar (which we of course had to try). 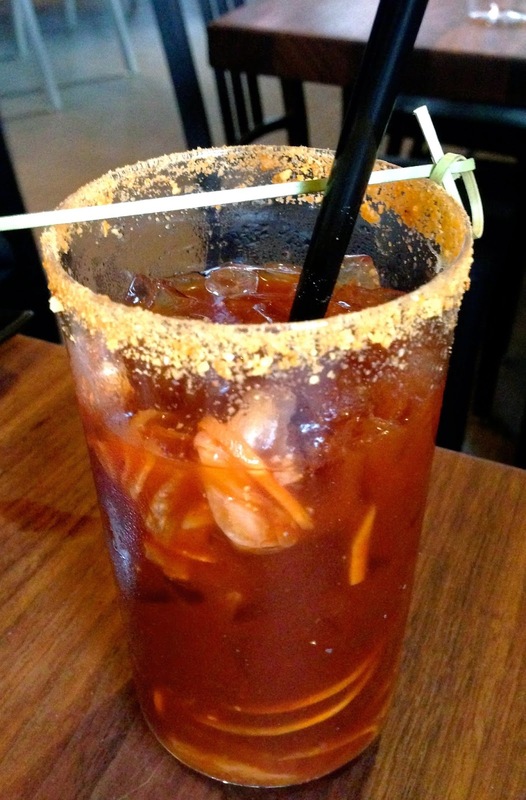 It was an interesting spin on the classic caesar with punches of soy sauce, black pepper and kimchi. For our main courses, we decided to order a bunch of dishes to satisfy our wide-ranging palette. To start, we went with the Sweet Potato Soup with pork belly bits and truffle oil for $5 and the Beet Salad with goat cheese, pearled onions, arugula, almonds and balsamic drizzle for $12. We then ordered four additional dishes: Tempura Skewer ($16), Swordfish ($18), Pork Belly ($15) and Mushroom Inari ($14). The Tempura Skewer was probably our favourite dish of the night, which consisted of scallops, chorizo, basil, cilantro and sweet chilli. The mix of flavours worked fabulously. The other three dishes, however, were just satisfactory. Nothing blew us away. The portion sizes were also extremely small for the price of the dishes. To finish off the evening, we had to try something sweet. 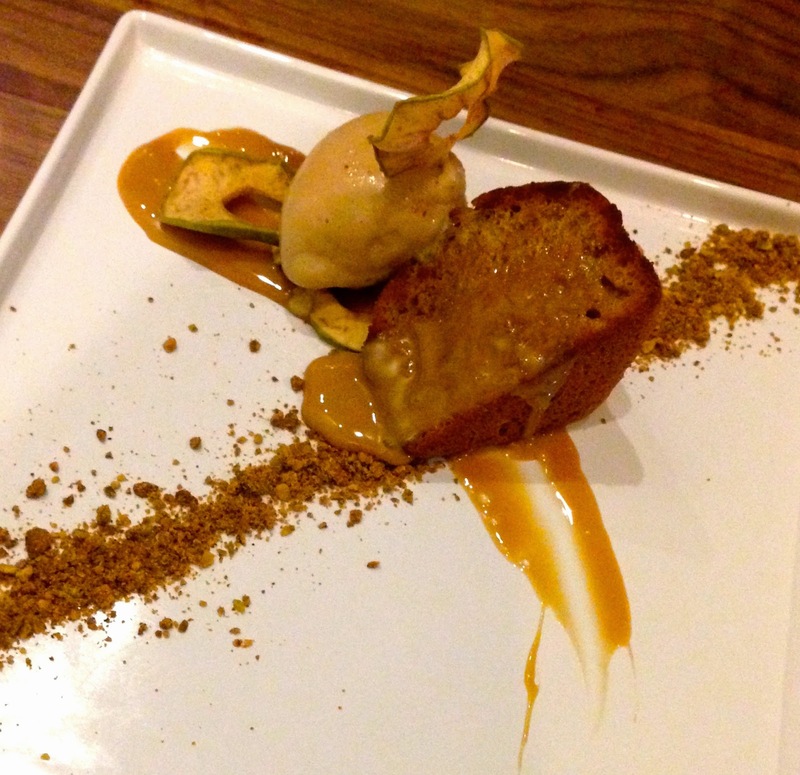 We went with the Squash Sticky Toffee made with pistachios, apples, Dulce de leche, creme caramel and ice cream. It was deliciously sweet, but we couldn't figure out how the squash came into play. Overall, I think we went into this experience with ridiculously high expectations and as such, we were let down. We were definitely hoping for much more creative menu choices, or at least something out of the ordinary. Verdict: 6/10...underwhelmed....great atmosphere, but conventional menu. Thanks for the review. I've been wanting to try this place out and it seems like a lot of reviews have mentioned that it's good but portions are small and not very filling.